Quick Disconnect Couplings are specified for dual fluid lines. Designed for use with dual fluid lines, DPC Series offers intuitive, simultaneous connections and disconnections with one thumb latch. TheseÂ Â¼ in. flow couplings, offered in acetal thermoplastic, are available in valved and non-valved hose barb configurations and keyed to ensure correct directional flow. Other features of this quick disconnect coupling series include integral terminations andÂ valve and latching mechanism. 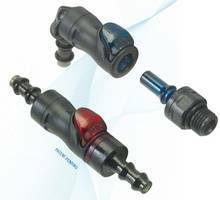 St. Paul, Minn. – CPC (Colder Products Company), the leading provider of quick disconnect couplings and fittings for plastic tubing, announces the addition of the DPC Series Couplings to its quick disconnect product offering. Designed specifically for use with dual fluid lines, the DPC Series couplings offer intuitive, simultaneous connections and disconnections with a single thumb latch. The ¼” flow DPC Series couplings, offered in acetal thermoplastic, are available in valved and non-valved hose barb configurations and are keyed to ensure correct directional flow. With integral terminations, the DPC couplings have greater reliability, shorter assemblies and faster installations. 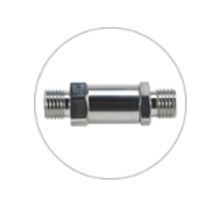 DPC Series quick disconnect couplings are ideal for liquid-based thermal management systems, applications using dual lumen tubing or medical therapies circulating cooling fluids. To discuss how your fluid handling application will benefit from integrating DPC Series couplings, or any of the other 10,000+ innovative connection solutions CPC offers, visit cpcworldwide.com. 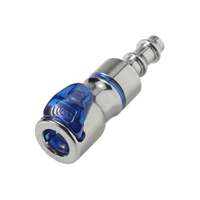 CPC (Colder Products Company) is the leading provider of quick disconnect couplings, fittings and connectors for the life sciences, bioprocessing, industrial and chemical handling markets. CPC is a business unit of Downers Grove, IL based Dover Corporation. For a free catalog or more information, contact: Colder Products Company, 1001 Westgate Drive, St. Paul, MN 55114. Phone: 651-645-0091. Toll-free: 800-444-2474. Fax: 651-645-5404. Web: cpcworldwide.com.